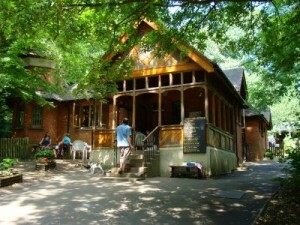 Even better if this cafe has a terrace or veranda, even better if the veranda is up amongst the trees. The rain washes the boundary between outside and in. An unpredictable season is best. A sudden shower brings a blessing of inwardness, then the sky clears. Until perhaps somebody walks in, like a song coming into a mind. An entity with an umbrella and a notebook. Perhaps a poem. A poem can be the slightest of things: a small breeze, the smell of rain. The following poem – for good or ill – is a slight one. It was written in the Lodge Cafe in Queens Wood, Highgate. It serves to hold for me a subtle state of being, a particular moment, until such time as I can better express it. having myself stepped aside from my life. - London’s Heart - as if it listens to itself. Light slides on and off my hair. The owner steps back in. I have left behind someone I need to kiss.